Conducting safety analyses will assist the practitioner in identifying intersections with safety issues and selecting countermeasures to improve them. The types of analysis can be qualitative or quantitative. 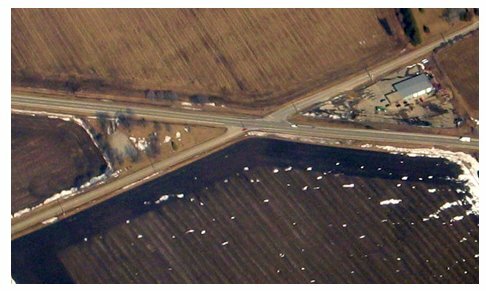 This section outlines steps to identifying intersections with safety issues and making data-supported decisions as to the type, deployment levels, and locations of countermeasures. These steps build on the previous discussion of overall safety implementation approaches and sources of information for identifying safety problems. Additional information on analysis procedures and data can be reviewed in "Road Safety Information Analysis: A Manual for Local Rural Road Owners." Crash frequency represents the number of crashes that have occurred at a particular intersection over a period of time. It can be determined from the State or local crash database (or law enforcement crash reports). Provide a report identifying intersections with a history of crashes. Once this information is collected and displayed, the local practitioner can compare intersections using cluster analysis to determine crash experience by frequency levels. Crash frequency alone is often inadequate when comparing multiple intersections or prioritizing locations for improvement. Crash rates can be an effective tool to measure the relative safety at a particular intersection. The ratio of crash frequency (crashes per year) to vehicle exposure (number of vehicles entering the intersection) results in a crash rate. Crash rate analysis can be a useful tool to determine how a specific intersection compares to the average intersection on the roadway network. For example, it is possible that two intersections in a jurisdiction (Intersection A and Intersection B) each have a similar number of crashes. However, Intersection A may have many more vehicles entering the intersection on a typical day than Intersection B, as shown in Table 2. In order to effectively compare the safety of the two locations, the practitioner must factor in the level of exposure to crashes for each intersection. Exposure data here is represented by the number of vehicles entering the intersection. Population and number of licensed drivers within a jurisdiction are other types of exposure data that can be used depending on the circumstances and availability. Crash rate is often used to prioritize locations for safety improvements when working with limited budgets to achieve the greatest safety benefits with available resources. This equation relies on traffic volume information. Actual and estimated traffic volumes are often compiled and kept by State highway agencies, local governments and property developers. In the following example shown in Table 2, two intersections have approximately the same number of crashes but different entering traffic volumes. By factoring in traffic volume (exposure), the calculation indicates that Intersection B may be a more promising roadway for safety treatments due to its higher intersection crash rate (measured in number of crashes for every 1 million entering vehicles). *Measured as the number of crashes per 1 million entering vehicles. Action: Calculate the crash rates for intersections experiencing crashes in the jurisdiction, and then use that crash rate to prioritize locations for investigation and possible treatments. Develop a database to record crash rate calculations over time for comparison with intersections that have potential safety issues in the future. This can provide practitioners with a jurisdiction-specific average intersection crash rate for varying situations. The geometric design of intersections can create navigational problems for motorists, potentially contributing to crashes at these locations. Among geometric design elements, two specific issues can cause safety concerns: sight distance limitations and skewed geometry. Insufficient sight distance can be a contributing factor in intersection traffic crashes. Intersection sight distance is typically defined as the distance a motorist can see approaching vehicles before their line of sight is blocked by an obstruction near the intersection. The driver of a vehicle approaching or departing from a stopped position at an intersection should have an unobstructed view of the intersection, including any traffic control devices, and sufficient lengths along the intersecting roadway to permit the driver to anticipate and avoid potential collisions. Examples of obstructions include crops, hedges, trees, parked vehicles, utility poles, or buildings. In addition, the horizontal and vertical alignment of the roadway approaching the intersection can reduce the sight triangle of vehicles navigating the intersection. It is important for approaching motorists on the major road to see side street vehicles approaching the Stop sign, and for minor road motorists to see approaching major road vehicles before entering the intersection. Poor sight distance can lead to rear-end crashes on the approaches and to angle crashes within the intersection because motorists may be unable to see and react to traffic control devices or approaching vehicles. The area needed for provision of this unobstructed view is called the Clear Sight Triangle (see Figure 3). The major road is an undivided, two-way, two-lane roadway with no turn lanes. If conditions at the intersection being evaluated differ from these assumptions, an experienced traffic engineer or highway designer should be consulted to determine whether different ISD values should be used. Source : A Policy on Geometric Design of Highway and Streets, 5th Edition, American Association of State Highway and Transportation Officials (AASHTO), 2004. Stopping Sight Distance (SSD) provides sufficient distance for drivers to anticipate and avoid collisions. However, in some cases this may require a major road vehicle to stop or slow to accommodate the maneuver by a minor road vehicle. To enhance traffic operations, sight distances that exceed the recommended SSD (as shown in Table 3) are desirable. 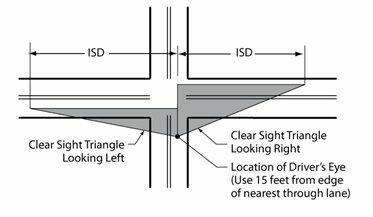 Note that design intersection sight distance criteria for stop-controlled intersections are longer than stopping sight distance to ensure the intersection operates smoothly. Optimally, an intersection should be designed to have roadways cross at a 90-degree angle. In situations where the intersecting angles are 60 degrees or less, the intersections are considered skewed (see Figure 4). The vehicle body may obstruct the line of sight for drivers with an acute-angle approach to their right. When crashes are occurring at skewed intersections, it may be desirable to reduce or eliminate the skew angle of the approaches. Treatments include pavement marking, delineator islands, and roadway realignment. Regardless of implementation approach, a field review should be conducted at identified locations. Intersection field reviews have the potential to identify safety issues and solutions. Field reviews can be conducted as informal field assessments or formal Road Safety Audits (RSAs). An informal field assessment is generally performed by an in-house team with available personnel. The team will spend time at identified intersections and document safety issues to develop recommendations for improvement. When conducting field reviews at intersections, one source of information to reference is the MUTCD. It provides the minimum standards for the installation and maintenance of traffic control devices on all public streets, highways, bikeways, and private roads open to public traffic.11 Complying with the MUTCD standards is an important step toward a safer transportation system. If the intersection is not in compliance with the MUTCD, it should be brought up to standard. Non-compliance is an important consideration that can affect road safety and may have liability implications. All regulatory, warning, and guide signs should display the same colors both day and night. Retroreflectivity (reflecting light back to its source) allows signs to do this. Stop and Yield signs should be installed as close as practical to the intersection and on the right-hand side of the approach to which it applies. The MUTCD defines specific functions for each category of sign. The MUTCD defines minimum dimensions for all signs. The installation of signs should be a conservative process as unnecessary signs could cause a loss of effectiveness for all signs. Action: Analyze crash data to determine crash frequency and crash clusters. Calculate the crash rate of identified locations for comparison and prioritization. Identify intersections with common safety-related characteristics for potential systematic treatment of safety strategies. Conduct field reviews of selected locations to determine their compliance with the MUTCD and identify any other potential safety issues and countermeasures.